She loves colors. Her favorite is Pink. The spiritual color that continues to inspire the unfathomable passion of teaching and educating the pupils of Calao Elementary School about the values of education and the zeal of universal love of oneself and of others, as a way of life. Calao, Prieto-Diaz, Sorsogon, [05.12.18] – A first innovative tool for learning has been established some three years ago and found its home inside the bucolic schoolyard of Calao Elementary School called dubbed as – Resort for Learning. A nook of knowledge was born out of sheer passion and creativity to reach out the non-readers to learn how to read. In an unassuming small space who used to be a patch of garden, was transformed into an outdoor “mini-resort” intended for learning. A small hut was built to provide cool shades and offers a roof from sunshine and rains – is a silent witness to this noble innovation that continually nurturing the fragile young minds in the village of Calao. 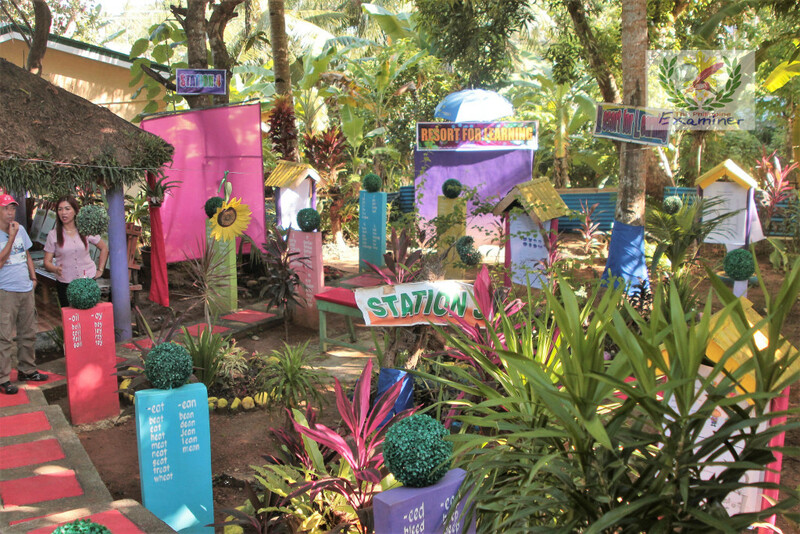 The Resort for Learning: The five reading stations consisted of the following: Station 1 is made of printed words, Station 2 provides The Marungko Approach and Family Words, Station 3 provides the Consonant Blends, Station 4, Phrases, Station 5 Sentences and Short Paragraphs/Stories. www.phiexaminer.com file photo. The lawn is shaded with trees, ornamentals, a cemented pathways, reading stations made of concrete exudes an ambiance of coziness that would attract pre-schoolers and pupils to learn how to read and recognize alphabets, short sentences and simple paragraphs with ease and entertainment. The area is also filled with printed materials inside the hut. The five reading stations consisted of the following: Station 1 is made of printed words, Station 2 provides The Marungko Approach and Family Words, Station 3 provides the Consonant Blends, Station 4, Phrases, Station 5 Sentences and Short Paragraphs/Stories. A Gubatnon dialect will soon to be introduced in the resort station in the coming school year in consonance to the curriculum on mother tongue so that the younger grades’ needs will be met. At a glance, the whimsical splash of pink superimposes the surroundings from the resort to the comfort room nearby and the Grade 3 classroom – a color that evokes the feminine character of the advocate as a charming Master Teacher 2. The philosophy behind in this resort is straightforward: to make education in Calao Elementary School entertaining and making entertainment educational. In the onset when the project was launched in the school year of 2014-2015 in my Grade 3 class, there are big numbers of pupils who are non-readers inside a cramped classroom. Out of 49 classroom pupils, I had 17 non-readers. Being alone, I can not do anything to teach them well – the resort for learning was established, that day the innovation kicked off, Mrs. Rubio quipped. The approach had paid off. The resort is not only confined to reading but other related activities to our lessons are also conducted, for example, while they are tasked to conduct activity inside the classroom, I also prepare for their second activity – as an incentive, they are only allowed to go out from their classroom whenever they finished their first activity, she explained. The ratio of 50% indoor and 50% outdoor learning activities are complementary to each other, Mrs. Michelle D. Rubio admitted. Tied to her own passion and slaved to her chosen profession she must endure teaching the non-readers in her class. Embarking on her pet project Resort for Learning is not a walk in the park for her as it entails focus, energy, time and money to attain her goal. Fueled by the undying passion Rubio has shelled out cash from her own coined term “MOOA” [my own operating account] to push through her dream project – the resort for learning and her techno-classroom. Since she calls it a dull, unimaginative and routinary process by continuously relying on chalks, books, and lesson plans, her imaginations have brought her into a dilemma – divide time and resources. At one point she found herself in a predicament in asking her self why she is doing the painting by her self late instead of staying home after office hours or just simply look for a handyman to do the painting, instead of doing the job by herself. Being alone inside the classroom she found the answer to her question: I found solace in getting out of the box as I face the challenge by forgetting myself in pursuit of my goal as a servant-teacher. True to her favorite color PINK: she consistently endures to be a compassionate, nurturing and loving teacher and a dreamer. Admitting that she cannot be confined in a place without a color, her painted classroom speaks for itself. The Resort for Learning is definitely Prieto –Diaz’ first and is supported by the immediate community, village elected officials, their municipal mayor and the incumbent governor. A non-government organization and private corporation had already granted their donations such as books and other reading materials to help sustain the mission. This innovation for reading purposes has been submitted for two consecutive benchmarking sessions – the recent was conducted last August 16, 2017. Eleven public elementary schools in the municipality of Gubat are readying their respective schools to replicate the program in the coming school year. Walk the talk most of the time is poignant especially at times when you are inside a situation that you have to practice what you preach. This is about the love and caring for others. This is true and the probing moment had arrived when my pupil named Manuel came into my life. That was in 2013 when I volunteered with our school principal Mrs. Marianne Z. Arines, to handle Manuel in my Grade 3 class so as to relieve the boy’s retirable and ailing teacher from the burden. I saw how the teacher-adviser of Manuel is facing difficulties handling the pupil, against all odds I assumed the responsibility for him. The boy was a badly behaved pupil who always a frequent visitor to the principal’s office for committing minor infractions in school like taking papers, slippers another personal thing from his schoolmates. In one instance Mrs. Arines, the principal gave Manuel crayons and allowed him to play it inside the principal’s office in order not to create a disturbance with other pupils in the school. These habitual dysfunctional attitudes had made him friendless. He looks like suffering from imbecility, malnourished, untidy and worst he was suffering with acute Otitis media [running ear] that made him an outcast. Being a solitary boy more often he plays alone. Manuel and I agreed that he will report to my class the following day which he agreed. I saved Manuel’s class adviser from nerve-wracking obligations, but only to meet resistance from my Section A class who are diametrically opposed my plan to get Manuel into my class at the very instance they learned my decision. The stress was now on my shoulders as they rejected the coming of Manuel into their class. It is now my full responsibility to win the hearts of my pupils by teaching them to understand the word compassion. Understanding their innocent objections I asked my self: Who in this world will really like a person with smelly flowing otorrhea? A moment of silence wrapped the pupils, after that moment – nobody talked and resisted against him. Manuel arrived early in school the following day. When the class started, all my pupils were all uneasy to the whiffing scent from emanating from Manuel – everybody as covering their noses due to the offensive body odor they are smelling. I felt pity for him seeing the spectacle that my class was so uneasy with the foul smell and he is unwanted. I had also a share of experience of his smelly otorrhea, that I myself was offensively affected with the unpleasant smell when I got hold of his pencils, Michelle admitted. After that experience, I see to it that whenever I hold his pencil I made sure that it is clean. To solve the problem, I gave him a bath every day in the comfort room that made my pupils so amazed by what I am doing to their new classmate personal hygiene. I taught him physical hygiene that provided him with a soap, clean clothes, a toothbrush, toothpaste to make him neat. I also asked him to change his clothes before the class starts to make him feel fresh and cool. Doing laundry on his clothes had almost made me her nanny. One day I heard my class was so noisy as I am approaching the room, only to find out that they are so pre-occupied with Manuel – a group of boys is giving a bath to Manuel while the rest are watching the scene with glee. The scene made me conclude that Manuel is no more an island as he is already accepted by his classmates as their friend and peer. His acute Otitis media was cured that school year. Seeing Manuel tidy and cured of his Otitis media I heard one time his classmates saying: Sana kami na lang si Manuel. Truly motivation, creativity, and freedom are powerful educational tools to inspire children to positive and functional attitudes. The fragile physical condition of the boy has turned from bad into worse after an injurious fall occurred on March 2014. The accidental fall has made his left thigh swollen as big as a human head and he was brought to Salvador R. Encinas District Hospital in Gubat. That was weeks before graduation in Calao Elementary School happened, worried but I can not attend to him as I was helping my mother in preparing the power point for the graduation rites that week. Manuel’s parents are seeking help for his hospitalization assistance around the village and which I also extended my contribution. Without seeing the boy, I requested the mother to inform me about the hospitalization. I waited for them to return for an update but they never came back. The parent’s absence has prompted me to give a call Dr. Hermo who for information about Manuel, through the physician I learned that the boy was having a high fever and his left thigh was in bad shape. The doctor had asked the parents to sign the paper, having penniless the poor parents were in big trouble for their son’s health condition, although very sick Manuel was not admitted to the hospital. Immediately I asked my mother to look for an errand to see the parents of Manuel to convince them to bring back the boy to the hospital. Manuel was admitted to the hospital that night but I only visited him a day after the graduation and saw his miserable condition. The doctor has advised me that Manuel needs to undergo a dialysis – his creatinine was measured at 450, his kidneys are malfunctioning that caused the swelling of his thigh. There is no option left, but to pull-out Manuel from the Gubat hospital and have him transferred to another hospital in Sorsogon City where a dialysis machine is available. A private physician advised us for an ultrasound – the result revealed the presence of abscess inside the thigh, the findings prompted the physician to recommend an immediate surgery to avert the rising creatinine that might endanger him and might cause his sudden death. We prepared the money for the operation and have it performed as planned. Manuel went under the knife that night. Seeing him frail and pale body on a stretcher towards the operating room has brought me to tears. Worried and tense I left his parents in the hospital to seek divine intervention – I kneeled and prayed fervently before the Black Nazarene beseeching for Manuel’s successful operation and safety. The prayer was answered as the one-hour surgery was a success. Manuel was awake when I arrived and is looking for me. The road to Manuel’s recovery from his first surgery was nipped in the bud by another accidental fall. The accident happened while Manuel was practicing to walk. Its back to square one again as his newly operated thigh has returned into swelling after the accidental fall. Another operation has to be performed again – this time an aluminum thigh implant is needed for him to walk again as his thigh bone was confirmed broken. The second operation was performed on Mothers Day [Sunday of May 13, 2014] – that was the first mother’s day in my whole life that I was not in the company of my family because I was in the hospital attending to Manuel. The precarious showing of vital signs manifested in his conditions has prevented me to be not with my family on that significant date. I went home late at night that summer and arrived my two children were all sleeping, Michelle recalled. My frequent hospital visits have opened my senses how miserable life is when you are destitute. Manuel’s bed is on the free ward and I could experience the sad plights of other patients and made me realized the depth of miseries of being poor – the will just die without seeing relief from pains and sickness because of poverty. Being poor and indigent medical assistance from the Department of Social Welfare and Development including the Philippine Charity Sweepstakes Office always comes late. During the first operation of Manuel, a test on my faith appeared. This about a physician’s tongue who uttered a word in the disguise of shrewdness and pragmatism to drop Manuel and I should stop helping the family and the boy on the hospitalization. The encounter occurred while we are waiting for Manuel’s imminent discharge when this physician talked to me. His words “bitawan mo” drop him came out seamlessly from his lips. According to him, Manuel’s case is a hopeless situation, to wish for a cure for bone tuberculosis is a waste of time and money. To my amazement, it has triggered a big question mo as the word “bitawan mo” was upsetting. His unkind word and intrusiveness have taken me aback. He was prodding me to just provide Manuel parents with PhP5,000.00 and leave them alone because you’ve done your part, Michelle narrated. Not contented the physician reiterated by saying “Madam please think that you also have your own children. What if a point in time arrives that they are the one needs medical attention and you are broke by attending to Manuel?”. I replied in the affirmative but defied the physician intervention and we decided Manuel should stay in our house and his parent because it’s not good to abandon Manuel in the middle of needs and assistance. Manuel and his parents stayed at our house and took care of him until he recovered. The praxes of innovative learning education were achieved in reaching out the lives of my pupils through the philosophy of a quality education in molding this fragile creature to value responsibility, freedom, and love of others become a priceless gratification in my life as a teacher and a mother. Getting out of the box teaching and altruism was indeed rewarding as motherhood is both an honor and a privilege, I was also enlightened, that motherhood is synonymous with servanthood. My mandate as a teacher has been finally defined when Manuel was able to read while the motherhood in me was again fulfilled when we saved the life of this lad in his bout against bone tuberculosis. Finally, he graduated this March. Manuel Dorado, Jr is joined the graduating class of Calao Elementary School last March 2018 with great happiness. In his simple words, Manuel quipped with a smile that he owed his second life to his surrogate parents who tenaciously stayed beside him on the lowest point of his life while fighting his bout against the threat of bone tuberculosis and showed the praxis of altruism.